Kingston’s Dr. Chris Simpson has been acclaimed president-elect of the Canadian Medical Association. His term as President begins August 2014. Simpson is professor of medicine and chief of cardiology at Queen’s University as well as medical director of the Cardiac program at Kingston General Hospital and Hotel Dieu. Simpson’s interest in health care policy is reflected in his BLOG which focusses on such issues as wait times, health human resources planning, and health care reform. In his BLOG he particularly looks at the achievements made in the Scottish Health System, suggesting our proximity to the United States makes it difficult to similarly modify our own system. Hospital Food: Will evidence and accountability be the end of rethermalized food? The food served in hospital may be directly linked to chances of survival for critically ill patients according to Dr. Daren Heyland, a staff physician at Kingston General Hospital. Heyland and his research team has just received a grant from the U.S. National Institute of Health to continue research into meeting the nutrition needs of high risk, critically ill patients. According to release from Queen’s University, such a grant to a Canadian researcher is rare. “The optimal amount of energy and protein given to a critically ill patient remains unclear but CERU’s (Queen’s University Clinical Evaluation Research Unit) review of current intensive care unit nutrition practice shows over recent years the amount of energy and protein delivered to critically ill patients is too low,” the release states (emphasis added). There’s no question that every time you process food, it loses much of its nutritional value. When a hospital converts from fresh to rethermalized food service, the patient meals lose more nutrition in the cooking, freezing, and reheating process. This is a scientific fact. Earlier this year OPSEU took advantage of the freedom of information process to seek food costs at South Bruce Grey Health Centre (SBGHC). Surgical services may end at Perth-Smiths Falls and Napanee Hospitals as part of a new clinical services roadmap in the South East region of the province. The South East LHIN is now consulting the public on the issue. A series of “workbooks” are on-line, some putting forward ideas for change, others broadly hinting at them. Unlike other such exercises, the SE LHIN is placing the emphasis of this new plan on financial sustainability. “Our existing hospital system was built on a model that is decades old, that doesn’t reflect the economic realities we face today,” the LHIN web site states. Despite the fact that core hospital budgets are going up by less than 1.5 per cent, the LHIN erroneously claims the cost of hospital care is increasing at twice the rate of inflation. April 19th staff of the Perth and Smiths Falls District Hospital were given an unvarnished version of the options for surgeries. They were told at a general meeting the LHIN is looking at everything from the status quo to providing all regional surgeries in Kingston. It’s clear from the ordering of the potential rationalization of surgeries that Napanee and Perth-Smiths Falls are the most vulnerable to these changes. “If you ask the general public if they’re going to get hip surgery in six weeks or two weeks, I can guarantee you they’ll take the two weeks if they have to go to Brockville,” Georgina Thompson, Chair of SE LHIN told the Belleville Intelligencer. The irony is Perth and Smiths Falls District Hospital presently has among the shortest wait times for hip replacement in the province. The wait is 71 days compared to 79 days in Brockville, 141 days at Kingston General Hospital and 192 days at Kingston’s Hotel Dieu. Two weeks wait for hip surgery may sound good to the uninformed, but the LHIN hasn’t explained how rationalizing services from hospitals with short waits to hospitals with longer waits is somehow going to accomplish this. Presently the shortest wait for hip replacement is 49 days, not two weeks. For that you would have to travel to Brantford. 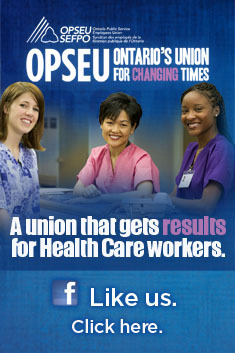 When the government introduced the idea of Local Health Integration Networks, OPSEU had argued it was paving the way for rationalization of services. At the time the union was accused of fearmongering. Now it appears to be happening. All of this is also taking place as a provincial panel is looking at the question of what is the role of small and rural hospitals. That question may be answered before they get a chance to make their recommendations. Thompson says such rationalization will streamline the way area hospitals work together, promising no hospital would close, but services may substantially change. “We have seven hospital sites today. We will have seven hospital sites tomorrow,” she told the newspaper. A committee from the Perth and Smiths Falls District Hospital has been meeting with the SE LHIN to demonstrate what the outcome of such choices would be on population health, including the impracticality of concentrating surgeries in a handful of regional hospitals.